Grobetrotting With Jeff: Okay, I understand the chanting - but does it have to be so loud! One of my most memorable adventures in Thailand was the opportunity to experience life with local inhabitants in a small Thai village not far from Chiang Mai. This involved sleeping in a local family’s home - sort of a grown up version of a kids’ sleepover except you can’t phone mom or dad to come and pick you up at two in the morning. 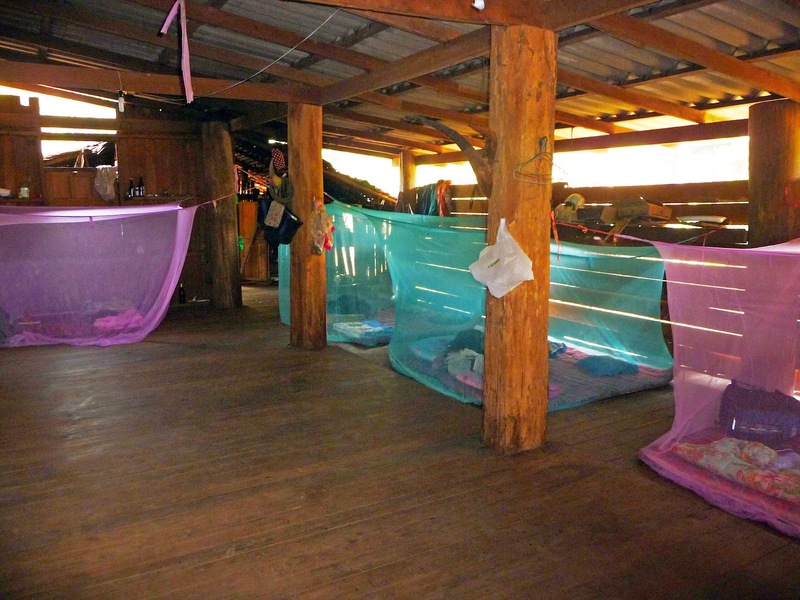 Upon arriving at the village we were ushered into the family home to see our sleeping accommodations. It turned out that all 13 of us would be staying in this particular home which doubled as the village recreational hall. They had erected a series of what can best be described as “tourist cages.” These were a series of six by six by four foot rectangular mosquito tents that slept two. They came in two colours: blue and pink. I take it the guys were to sleep in the blue ones - the girls in pink. The enclosures hung in a row like a series of cages at a zoo - convenient for the local inhabitants to stroll down and gawk at the tourists. I looked to see if there were signs in Thai warning them not to feed us or stick their hands into our cages. I should point out that the tiger cages we had visited at the Ubon Zoo were much more spacious. The afternoon entertainment was an “Elephant jungle drive.” I’m not sure if the entertainment was designed for us or the elephants. 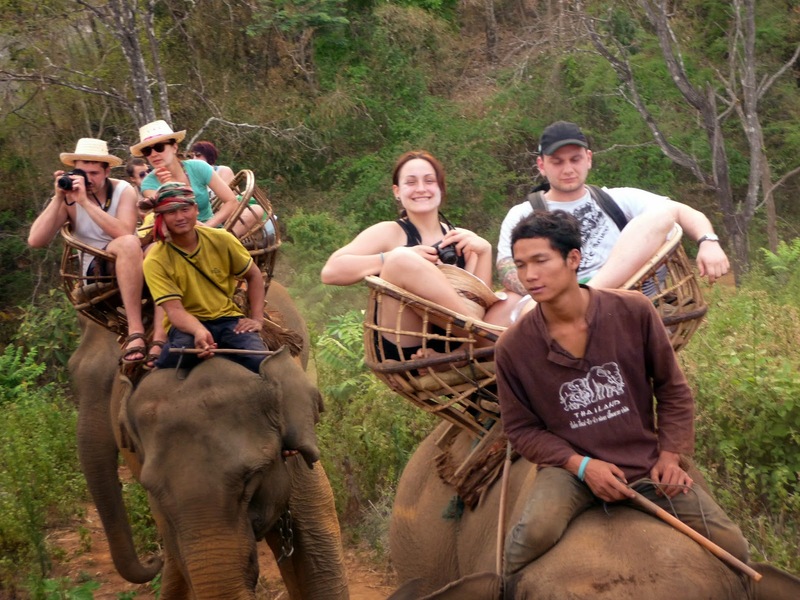 Two of us were strapped to the back of an elephant while the driver perched on his head like a hood ornament - supposedly to direct the breast. I commented that I felt like a sack of rice sitting in the uncomfortable two person “chair.” I was informed that was because the “chair” was, in fact, constructed to carry sacks of rice not people. The “jungle” turned out to be a grazing area where the elephants wandered about, ripping up and eating various bits of foliage until they were full or bored. They then wandered back to the village with us still clinging to their backs. I made a note to suggest that there might be an opportunity to make money back home by strapping tourists to the backs of cows and letting them wander in the meadow for a while. After dinner it was time to retire to our cages. I was lucky enough to have two of the loudest snorers on either side of me. Fortunately at full volume my iPod almost drowned them out. This worked well until about 3:45am when the battery died. At 4:00am the chanting began from the monastery on the hill across the way. It usually starts at 5:00am, but since it was Thai New Year we were entertained for an extra hour. Actually it wasn't live chanting: The first monk to wake up put on a scratchy 78 record of chanting - complete with drumming and bells. The chanting was accompanied with loud bursts of ear splitting feedback from the archaic PA system. This, in turn, woke up every rooster in South East Asia who then joined in the cacophony until the feedback briefly settled down. The rooster racket woke the dogs who joined in as well. At 5:00 the main event of live chanting commenced. I must admit after a while the rhythmic chanting became hypnotic as I tried to dose amid the snoring, bursts of flatulence and other noises that 13 uncomfortable people make while pretending to sleep. After a while I thought I could detect secret messages hidden in the monks’ chanting: bons mots like "The Prime Minister doesn't wear plaid," "Mercedes hold their value more than Chevy's," and "John is dead - maybe." At 7:00 am I looked through the mosquito netting and detected flames leaping high at the far end of the building. I debated whether to scream "Fire" or maybe just get up, visit the washroom outside and observe what developed. I'd been burned before shouting false alarms of fire, earthquake and Tsunami. Good thing I waited - It was only one of the villagers pouring gasoline on the cooking fire at the far end of the wooden structure. At 8:00 we were served an authentic Thai breakfast comprising of burnt toast and hard boiled eggs. "What are those things?" asked one of my fellow travelers from California. As we packed our stuff into the vans for our next adventure I managed to talk to one of the villagers through an interpreter. "I can't believe you people actually pay us to sleep on our floor in cages and eat toast and eggs!" he exclaimed. "Neither can I!" I replied. 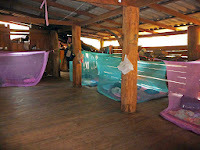 I thought I was through with camping but we were informed there was a change in our itinerary: Instead of spending TWO nights in the village, we would spend the second night tenting in one of Thailand's National Parks! The following morning we rafted down the Ngao River for several hours to reach our campsite. So how many can fit on this thing? The rafts were not quite what one might envision. Back in Canada river rafting usually takes place in big rigid hull inflatables holding eight to ten people. 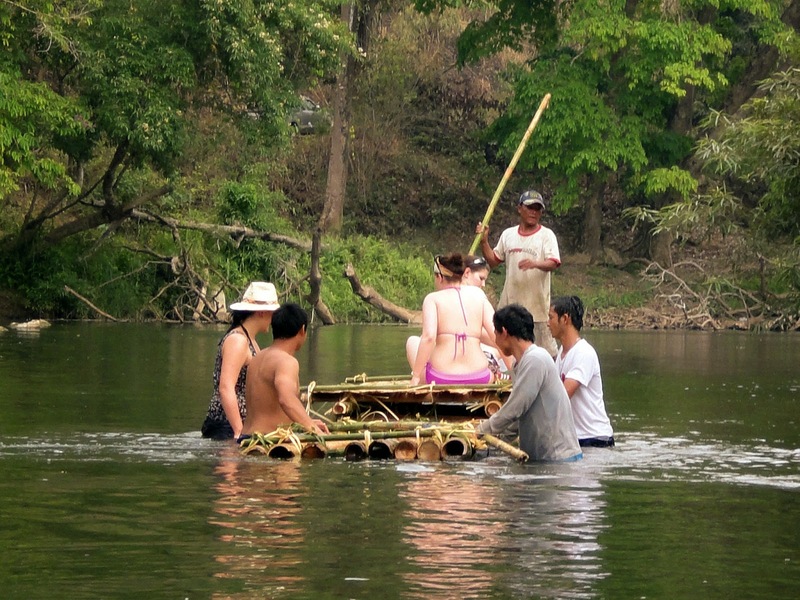 These particular rafts consisted of three or four sticks of bamboo loosely lashed together with vines. The load limits are scientifically determined by loading bodies on until it begins to sink; then removing one person. The rafts also have a nasty habit of coming apart every couple of miles. The good news is that we are at the height of the hot season which means water levels are low – sometimes not more than a few inches in places. After a few hours of river bottom scraping we arrive at Mae Ngoa National Park. The park people have created a nice little tent camp for us at one end of the park. I am assigned a four person tent along with a young British couple and Nikki,, a young woman from Calgary. The British couple decide it’s more romantic to spend the night on a bamboo platform perched over the river and swat mosquitos all night. I decline sleeping on one, knowing if I rollover I’ll end up in the river. So Nikki and I share the tent. In the middle of the night I noticed she's pulled off my sleeping sheet. I pull it back- she pulls it off again. This tug-of-war continues until she grumpily informs me it is "HER sheet." I retort I damn well know it is MY sheet. She reluctantly relents. If forty years of marriage has taught me anything, it’s how to hang on to my bedding. Later in the morning when she gets up I notice I have both her sheet and mine! While she is out of the tent I fold them up so she won’t discover my mistake. She figures it out immediately. Upon recounting this misadventure to my wife she replies "...and she BELIEVED you when you said it was yours?? She has a lot to learn!" On the last day of the tour I finally get to see the bridge over the River Kwaii. Not “the” bridge – it was long gone, but a more substantial railway bridge built about 15 years later. Still I manage to walk over it whistling the theme from the movie. Most of the other tourists and the monks gave me a wide berth – attributing my strange behaviour to the heat. All in all, the tour was a lot of fun. This particular tour had a nice balance of activities and free time which allowed one to shop in the market or just chill out by the pool. to them. Our CEO, Phil, worked hard to make our trip enjoyable. He was there to facilitate the trip - not act as a “camp counsellor.” On many occasions we had the opportunity to explore on our own. Phil looked after all the details that put me in a panic: making sure all the travel arrangements and hotels were booked, keeping an eye on our luggage, acting as a guide and providing local information that just isn’t in the guide book. After we checked into a hotel, he waited to make sure our rooms were up to our expectations. The accommodation were more than adequate – every hotel we stayed in was locally run, modern, clean, air conditioned and had a swimming pool – which was essential after a day’s activity in the heat. The hotel staff bent over backwards to try and make us happy. If you like tigers, elephants, and river rafting this adventure might be for you. Keep in mind you need to be reasonably fit to enjoy the hikes.